Enfrijoladas are one of the most beloved humble dishes made out of beans in Mexico. I almost can imagine some Mexican grandma in a hurry trying to make a meal with ingredients for two that will serve four or six with the beans she had. So Bad-a-bim! 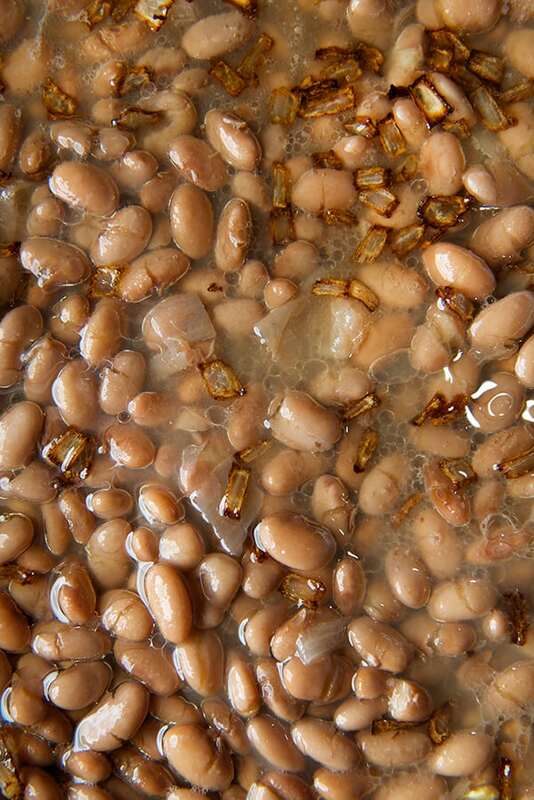 …she created a sauce, in order to stretch the beans, for all to eat. Aren’t these kinds of recipes the ones that everybody loves the most?…Serendipity in the kitchen can work love spells, just like this recipe. Imagine fresh corn tortillas smothered in a smooth velvety bean sauce that has been seasoned and tinted with dry chiles. 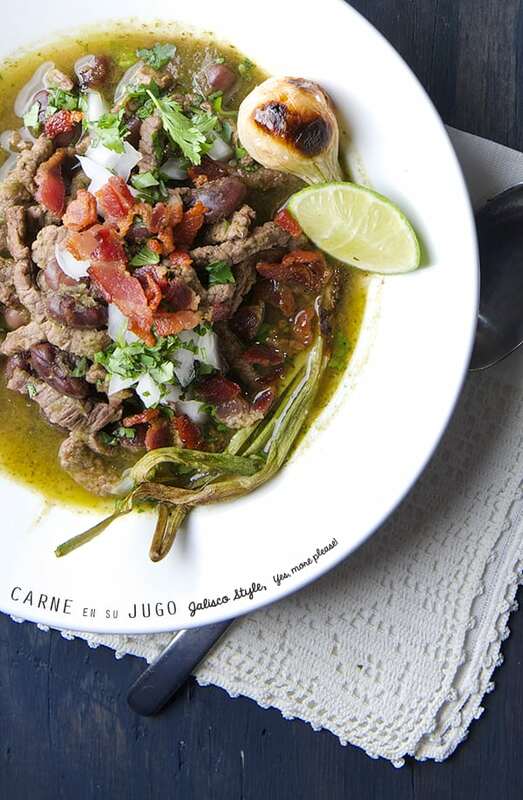 This dish features smokey anchos and a bright flavor guajillo chiles, sauteed onions and a couple of garlic cloves, all seasoned and blended to create a light and velvety bean sauce. 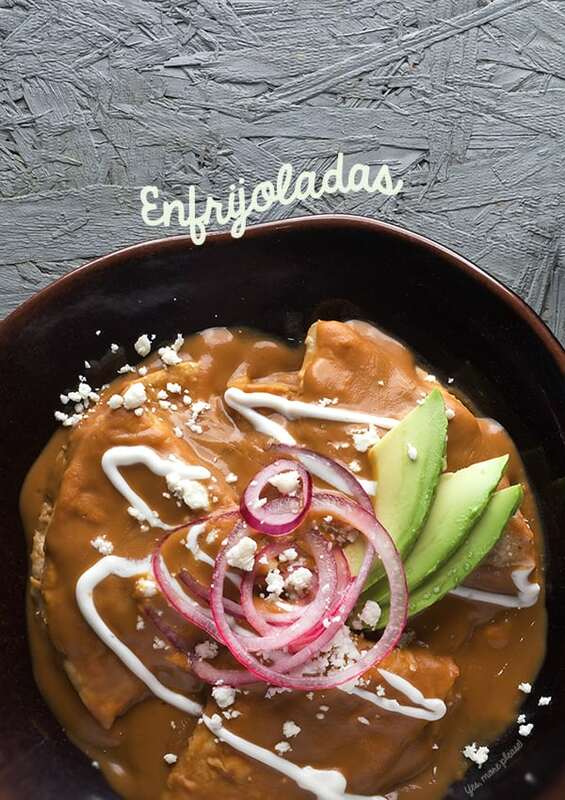 Enfrijoladas are the cousins of enchiladas, only lighter. 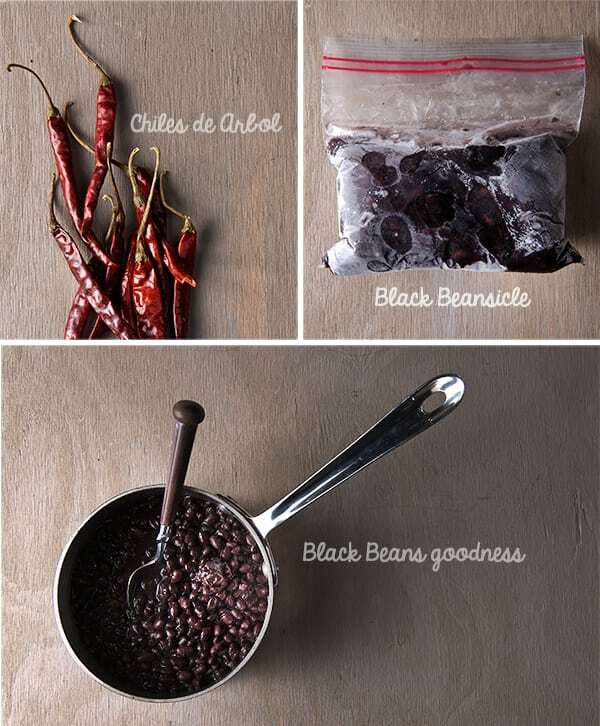 This velvety sauce, has a mild spice flavor, that in combination with the earthy and creamy bean texture make the most luscious bean sauce. This is the perfect breakfast on a rainy weekend morning. Or a even cold snowy morning, if you live north of Texas. The origin of this dish is unknown to me yet very familiar. It’s a classic everywhere in Mexico. There are dozens of variations with different toppings and seasonings from various regions, families, grandmas, mercados, or restaurants. This is the dish in its purest form. All principles items include fried eggs, dried chiles, tomato sauce, tortillas, and that last onion section that you didn’t quite finish on Thursday. This Mexican one pan wonder is the weekend antidote when you wake up extra hungry and craving a breakfast worth making. Imagine the creamy runniness of a sunny side up egg, smothered with savory spicy warm salsa over soft fried corn tortillas, a side of black beans, crema, and queso fresco. I would wake up to that in a flash! 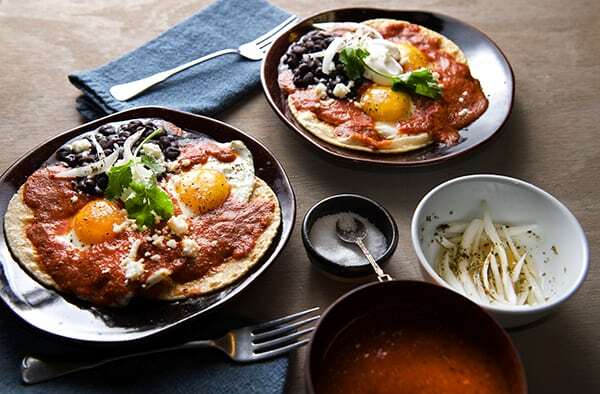 My Huevos Rancheros version gets a side of black beans which I prepare almost every month by cooking a large batch in a slow cooker. I make little portion bags that I freeze for quick use. It makes my life easier and tastier. Ian calls them “Beansicles”. They are very easy to defrost and use either whole or smashed when ever needed they are there for you. Now, what you need from the pantry is that forgotten can of tomatoes. Please check your refrigerator drawers for a couple of fresh ones if in season. I always have my staple dry chiles in the pantry. Dried chiles are miracle workers. 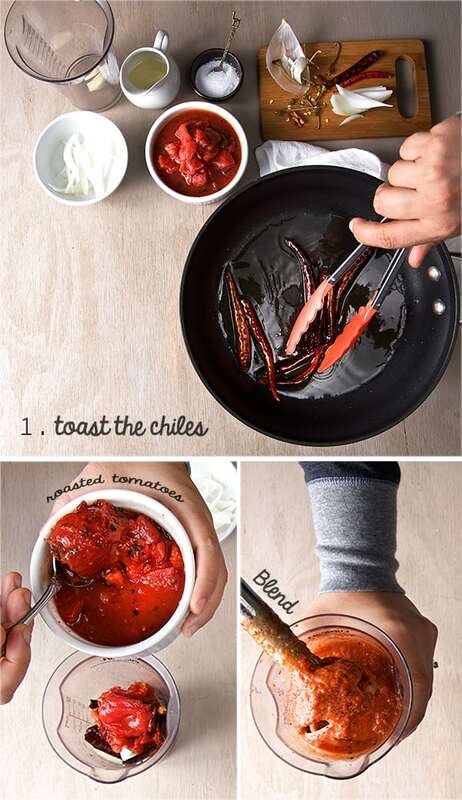 I can make salsa in a flash, or spice up soups or even hot cocoa like this. Fresh chiles? Yes, please! Serranos, jalapeños, chipotles en adobo; for me all variations are delicious as long you follow the ranchero principle: simple sauce + fried egg + corn tortilla + beans = Best Huevos Rancheros. Please no melty cheese in my Rancheros, save it for a quesadilla. 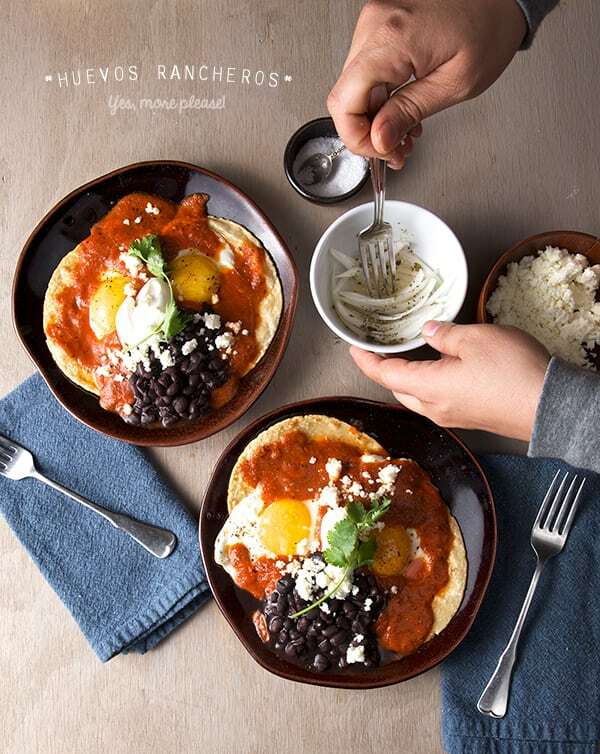 One of my favorite version of Huevos Rancheros Its the one you are about to see, easy enough to prepare them before coffee, and the spicy kick to the sauce will add to your morning wake up. 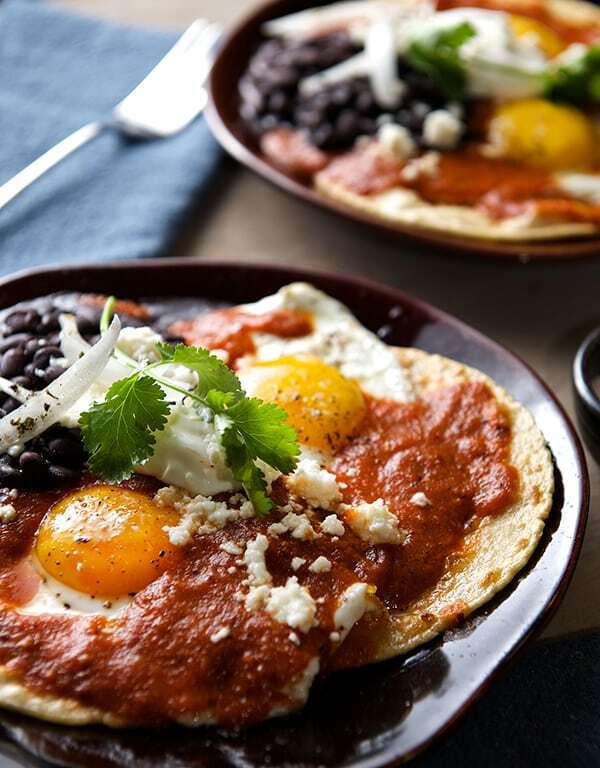 Huevos Rancheros cures hangovers, rainy mornings, helps you forget weekly stress, and fuels the most ambitious of Caudillos. 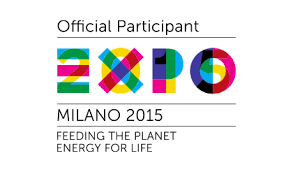 Its uncomplicated preparation will give you a boost of confidence and culinary accomplishment. The way I prepare them could work for bigger crowds if arranged on a large platter or for a brunch with friends or neighbors. All you have to do is learn how to fry an egg and combine 4 ingredients for a killer salsa. Enjoy! 4 corn tortillas best kind you kind find. Corn oil or your frying oil of preference enough to fry the eggs. about 2-3 glugs. 1 cup Black beans whole or fried is up to your preference. 1-1/2 cups roasted tomatoes I used roasted canned, if using fresh when in season you will need about 4 Roma tomatoes. 1/8 onion slivered and rinsed*, 1/2 lime juice, one good pinch of salt, one good pinch Mexican dry oregano, combine everything on a small dish, wait for 10 minutes, serve. * I always like to rinse my onions when they gonna be eaten raw, it smooths away that sharp taste, and you will not have to brush your teeth five times before the flavor on your palate is gone. 1. Start by preparing all your toppings, warm up your beans, make the quick pickled onions, set a side. 2. Remove the stems of all your dry chiles de arbol. 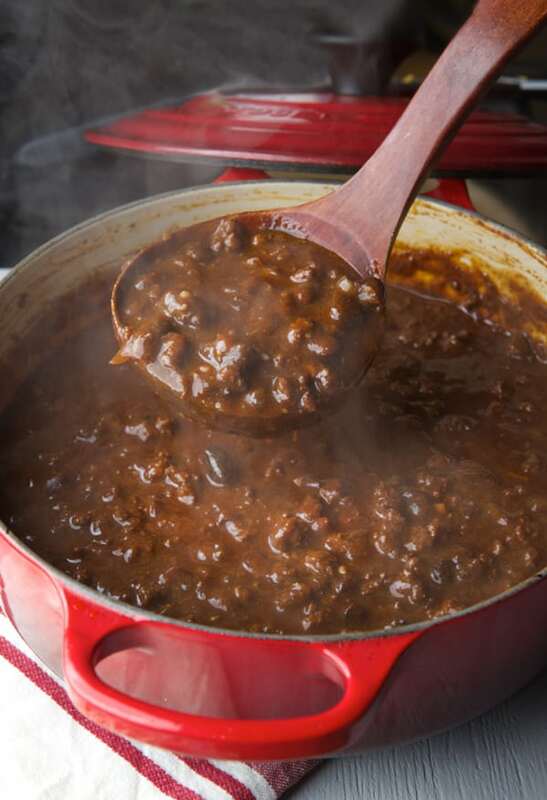 On a medium size frying pan, (good enough o fry some sunny side up eggs) place about two glugs of Corn oil over medium high heat, add the chiles and toast them tossing often, until a deep dark red. Remove the chiles, and add 1/8 of an onion for a quick sauté. Remove the onion, turn of the pan. In a Blender or with the help of an immersion blender Combine the roasted tomatoes, the toasted chiles, one garlic clove, the sautéed onion, 1/2 cup water,salt and a bit of black pepper. Blend until smooth. Set aside. 3. Warm up over medium high heat the same pan and oil you use to toast the chiles and onion. There should be plenty of oil to sauté the corn tortillas. If not enough add a bit more oil. Oil must be hot before soft frying the tortillas. Cook the tortillas in the oil one by one both sides. Tortillas should have a toasty color and they should be playable. 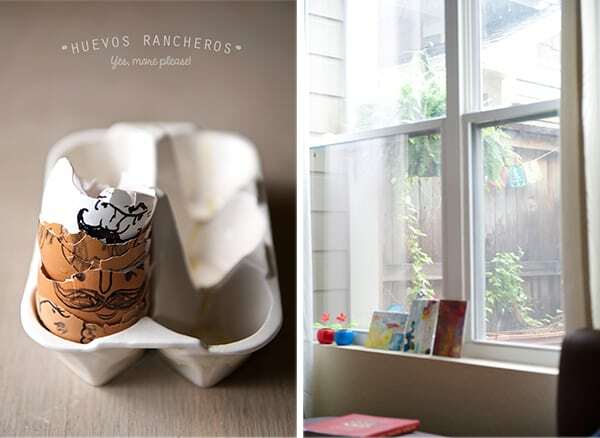 Place the tortillas as you go into the plates; one tortilla per egg. 4. Using the same pan and oil fry your eggs. I like to fry 2 eggs at the time, so they have lots of room and the temperature of the pan does not drop. I like my eggs with a bit of crunchy edges but soft runny yolks. It’s really up to you, cook them up to your preference. Place the eggs on top of the tortillas one egg per tortilla as you go. Remember that it is important letting the pan and oil to come up to hot temperature in-between egg batches. Like I said, I like sunny side up eggs in this recipe so I do not over cook the yolks. In fact I leave them a little under done, so when I pour the warm sauce over the eggs, it will warm them up and finish the cooking to a perfect creamy runniness. Take this in consideration when your cooking your eggs. 5. Once your eggs are ready, in the same pan with the remaining oil and while it warm add the sauce. (Be careful sauce might get a bit feisty, you might end up with a polka dot pajama!). Lower the heat. Stir and season with salt and pepper. Simmer for 2-3 minutes. Sauce should be rich and at the same time lose enough to cover the eggs. If the sauce is too tick add a bit of water or chicken stock, if to loose keep reducing it. 6. Taste your sauce for seasonings and adjust if needed. Sauce your eggs with plenty of warm sauce. Place leftover sauce in a small bowl and take it to the table for an extra spoon or two. Serve a couple of tablespoons of black beans on the side, top with queso fresco, crema, cilantro for garnish and the quick pickled onions on the side. Enjoy! 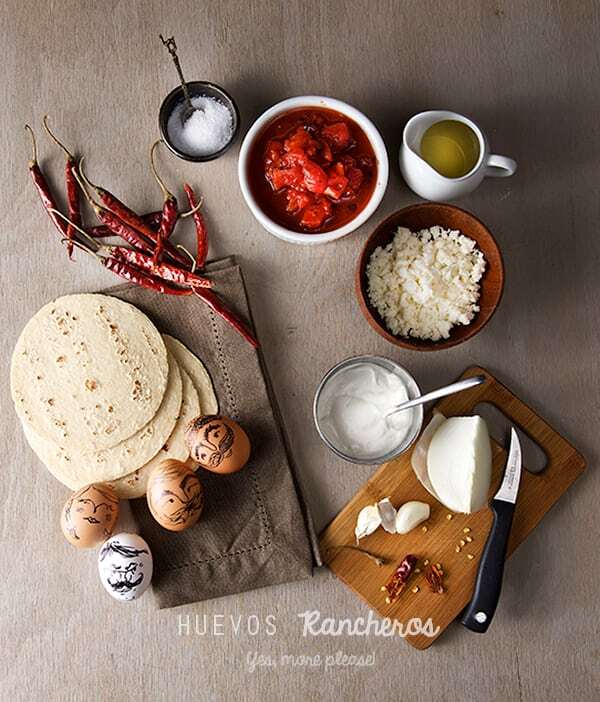 Huevos Rancheros, A great rainy weekend breakfast!